If fish steaks are large, cut into 6 serving pieces. Mix remaining ingredients except lime wedges in shallow glass or plastic dish or resealable plastic food-storage bag. Add fish; turn to coat. Cover dish or seal bag and refrigerate, turning fish once, at least 1 hour but no longer than 24 hours. Heat coals or gas grill for direct heat. Remove fish from marinade; reserve marinade. Cover and grill fish about 4 inches from medium heat 11 to 15 minutes, brushing 2 or 3 times with marinade and turning once, until fish flakes easily with fork. Discard any remaining marinade. Serve fish with lime wedges. For variety, try this recipe using swordfish or halibut steaks instead of the tuna steaks. Arrange the cooked tuna steaks on a pretty platter. Garnish with lime peel curls and fresh cilantro. 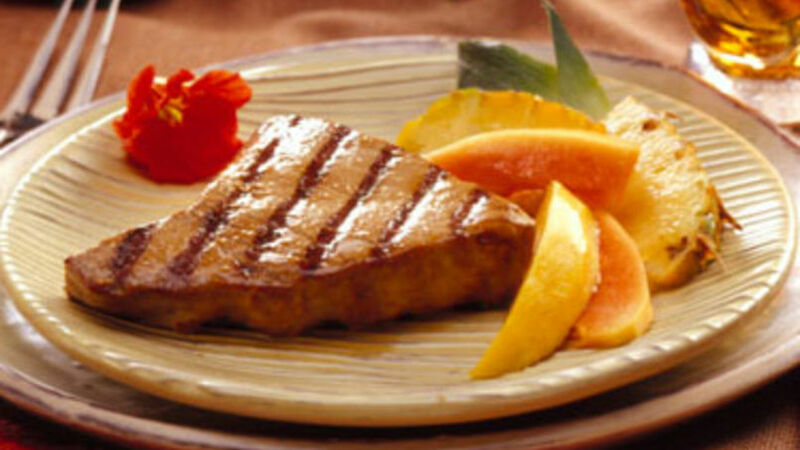 Fresh or frozen tuna steaks have light to dark pink flesh. As the tuna cooks, the flesh lightens to a pale cream color.